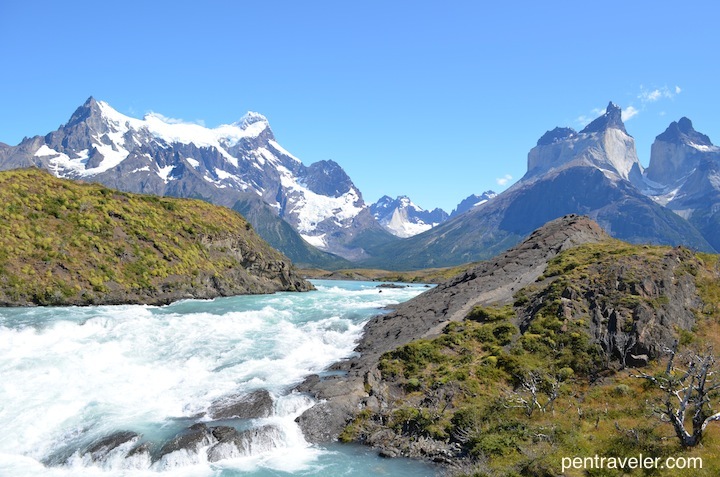 Note: This is a day-by-day technical guide to trekking the W in Torres del Paine, Patagonia. For a related read, check out my previous post on what I learned about myself doing the W as a solo hike. 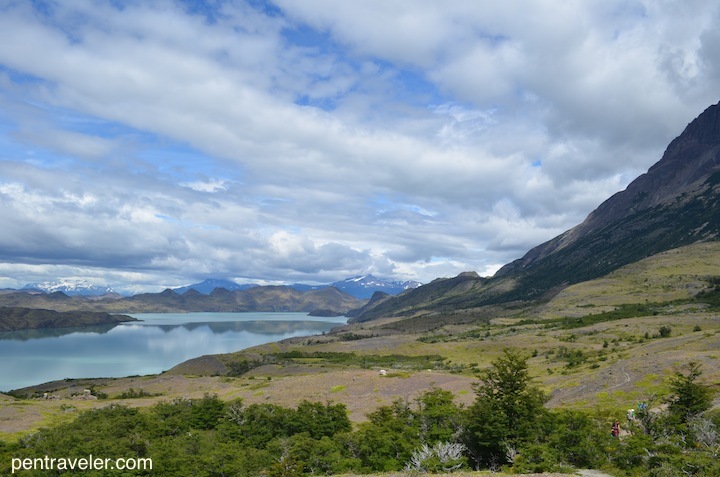 YES, you can hike the five-day “W” in Torres del Paine National Park, Patagonia, Chile, with no problems as a solo female trekker. I start there, because I searched for that clear answer before deciding to head there anyway. On the trail, I felt completely safe, physically challenged by the hike, and in awe of every spectacular curve of the path. I never had the slightest concern of getting lost. So go do it. Go now. This was my experience, with the huge caveats that a) everyone (of course) has a unique experience, so mine doesn’t guarantee anything; b) I went during high season in mid-January; and c) I had sunny, nearly no-wind weather the entire five days. Reading and Planning: I spent maybe an hour over the course of a few months reading about the W trek vs. day-hike options. But by far the most helpful pre-trek information was from a free orientation session at Erratic Rock Pub in Puerto Natales, which I attended the day before my trek. This session served as my Gospel of the Trail, and henceforth will be thus referenced. 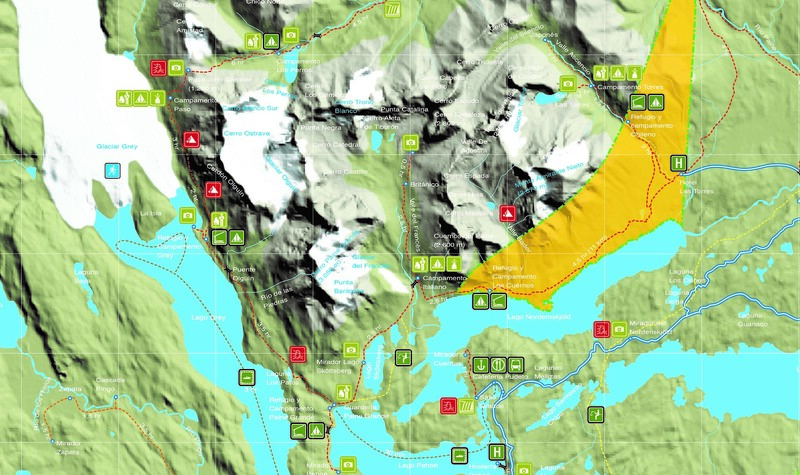 Direction of Hike: The main decision you’ll need to make before you arrive to the park is which direction you want to go. I went east to west and loved every minute. This meant I did the hike to the base of the Torres the first day—by far the most challenging and crowded day—and everything felt easier from there. Some people say west to east is prettier, but when every curve of the trail reveals a view that makes you say “WOOOOWWWW,” I think you’re in good shape. Training: I aimed for 30-60 minutes of cardio and strength training three to four times a week for about three months ahead of my trek. Totally worth it. 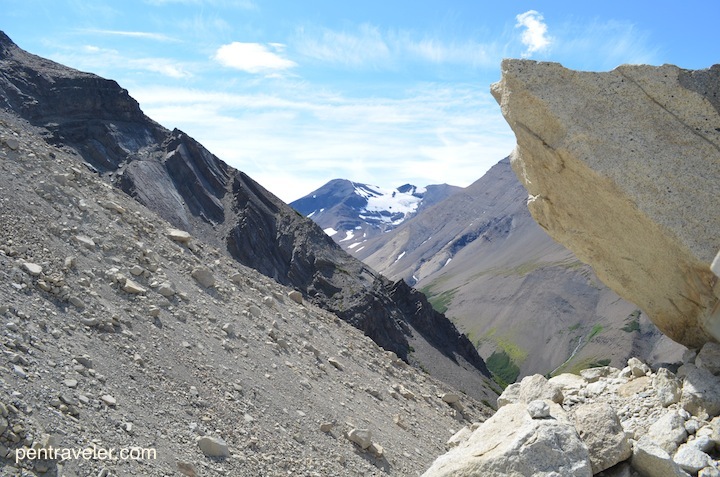 Alone vs. Group: As a solo female traveler/trekker, I initially thought I would need to do this trek with a tour group, but I found enough blogs before booking to understand that in high season, you’re not isolated on the trail at any point. This was definitely true. I was alone for maybe one wonderful hour at a time one of the days, but otherwise, I passed at least one or two people every 15-30 minutes. The campgrounds felt safe at night, and there is no way you can get lost—there is only the one, extremely well-marked trail. There were plenty of trekkers who also arrived alone if you do want to pair up with someone for a day or few. I passed a few tour groups on my last day, and by then, it felt absolutely silly to have even considered a tour group might have been necessary. Reservations: I rented a site, tent and mat at four separate campsites along the trail, which was great in keeping my backpack light. Every ounce less helps if you don’t do this kind of thing often, which seemed to be the case for a lot of people on the trail (including me!). Trekking Poles: Not having trekking poles was my one and only regret of the entire experience. They definitely would have helped on the steep, slippery descents. DAY 1: Hard. Arrive to park plus Torres Central Camp to Torres Base and Return. 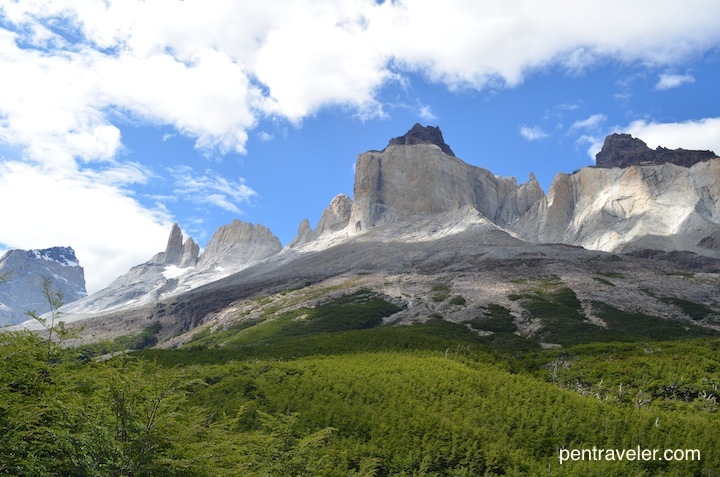 I hopped onto one of the many early buses from Puerto Natales to Torres and arrived at my campsite around 11 a.m. with the plan of relaxing in a gorgeous place, taking photos near the campsite for the afternoon, and then hitting the trial early in the morning. 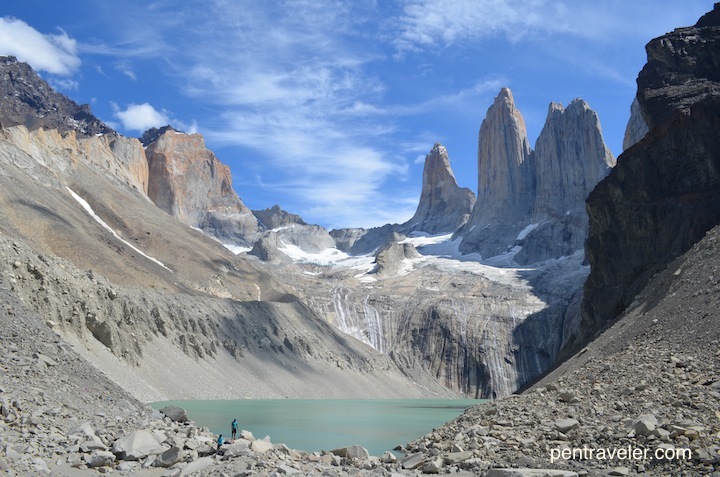 After a quick chat with one of the campsite workers—he said the weather was predicted to be bad the next day—I quickly packed a daypack and set out for the Base of the Torres. The clear-skies day meant great views and intense sun. Re-apply sunblock liberally. Following the Gospel, albeit with skepticism at first, I filled my water bottle with water from the glacial-fed streams. But I had no problems the five days in the park, so I count this a miracle of nature that a park with 115,000 visitors a year still has clean, drinkable water. I kept nuts in my pocket and snacked frequently as I walked (per the Gospel again), speeding past all the folks who were sweating under massive backpacks. There are two campsites up the trail toward Torres, which is where you would stay if you want to make the red-rocks sunrise. The last slog up to the Base was HARD—36% of the full day’s elevation gain of 2296ft was in just the final 45 minutes of ascent. I gave myself a kick in the behind when I passed a 70-something-year-old woman descending. A tiny ledge, steep slope and slippery dirt is ripe for slipping—of which I saw enough to go very slowly. And yes, your path is in this photo. I sat at the Base for a while, writing, eating, and convincing myself I could totally do the return hike. Also, I had to. Going down was harder than the climb up, given the slippery slope plus gravity—I can’t imagine doing this in the rain and driving wind that usually batter the mountain. An hour out from my campsite, I had just three thoughts, playing on loop: Bathroom, Beer, Shoes (off). I more or less crawled back into my site, drank the most amazing warm beer in the history of beers, cooked my first-ever cookstove meal with no burns and only a small eek!, and slept like the dead for 10 hours. DAY 2: Anything seems easy after that Day 1. Torres Central Camp to Cuernos Camp. 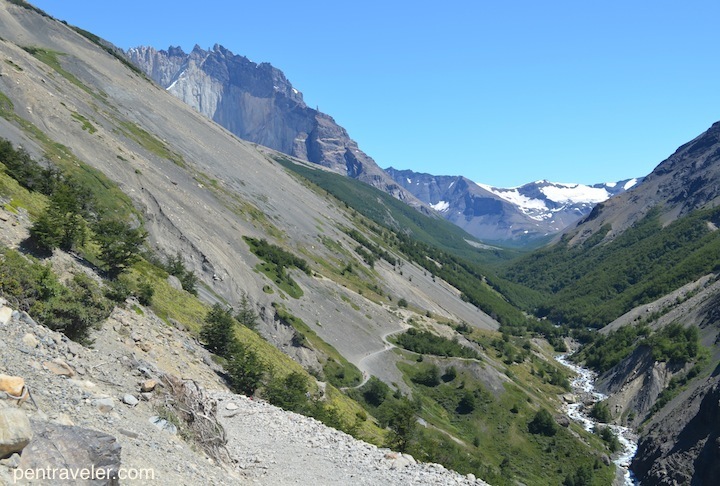 I had passed the riverside campsite of Chileano on my hike up to Torres the day before, so I had nothing to gain from going back up—this time with my pack. 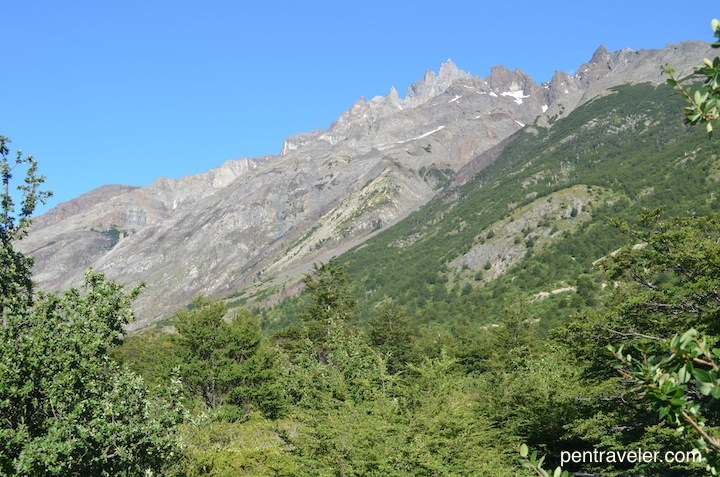 The company that owns the campsites, FantasticoSur, very kindly checked for space, confirmed its availability, and so my plan changed—onto Cuernos for the day. Despite the poor weather predictions, only a few clouds hung in the sky, and the wind was nonexistent enough to see reflections in the lakes. The wind picked up just minutes after I arrived and started snapping photos of the reflections in the glacial lake. You can see the wind just starting to disturb the calm lake here. Even with my 25ish-pound pack, I loved this day’s hike. I had nice 15-30 minute stretches alone, and every turn revealed new surprises. I wasn’t in love with the crowded Cuernos campsite, but the location was hard to beat—just under the looming Cuernos peaks. Here, I re-met a trail buddy, Zackary, a hiker from the Bay Area who was also doing the W alone. We had first met speaking Spanish (badly) in a hostel the day before in Puerto Natales, before we realized we were both native U.S.-ians. We made plans to hike together for a bit the next day. DAY 3: Easy, then kind of hard. Cuernos Camp to Frances Glacier Mirador to Frances Camp. Over ramen instant soup for breakfast, I met trekkers hiking the 10-day “O” circuit at the shared cookstoves table. A solo female trekker from Germany, Julia, and I started chatting, and by the end of breakfast, Zackary and I had a third co-hiker for the day. “But I’m veeery slow,” Julia warned. I assured her it would not be a problem. We met up with Zackary, and my two hiking companions immediately launched into a slow-off, each determined to convince the other they would be the slower hiker. As we were leaving camp, the campsite worker nowhere to be found, I decided at the last minute to collect my gear in the hopes of finding a space for the night at Frances Camp, two hours west on the trail, to save me having to backtrack to Cuernos for a second night. 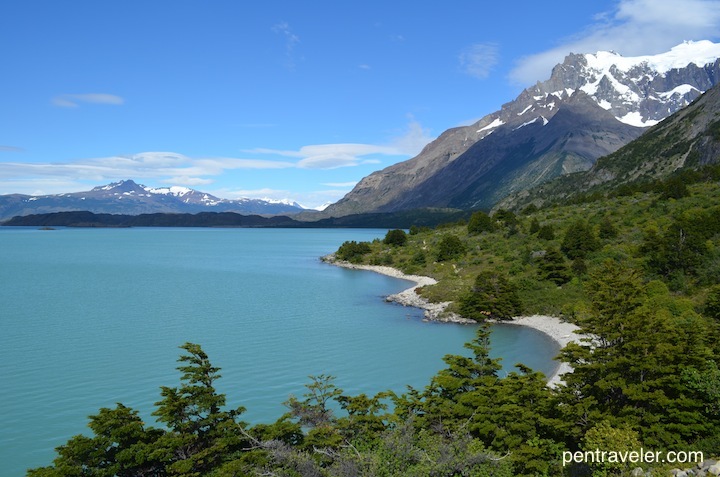 The hike from Cuernos to Frances was (again) stunning, hugging the glacial lake with distant rumbling of glaciers calving. Yet another gorgeous view on the W.
At Frances Camp, I arranged to change my reservation with just a little bit of a hard time from the camp worker (no, I did not bring a printed email of my reservation with me, and no, no one else had asked for this), and dropped my big bag in exchange for the daypack. Just 30 minutes more, and we reached Campo Italiano, where everyone leaves their bags for the hike up into Frances Valley. My hiking crew started up the trail and within 15 minutes, we arrived at a plaque that said Frances Mirador—thus spurring a debate between Zackary (a lawyer) and Julia (a journalist) if we had indeed arrived already at the point that should have been an hour hike in. I half-heartedly weighed in, but was itching to keep going, so Zackary and I moved on, bidding farewell to Julia. Within seconds, descending hikers confirmed that we were not insanely fast, but in fact did still have at least one hour until of hard up-valley hiking to the Frances Mirador. 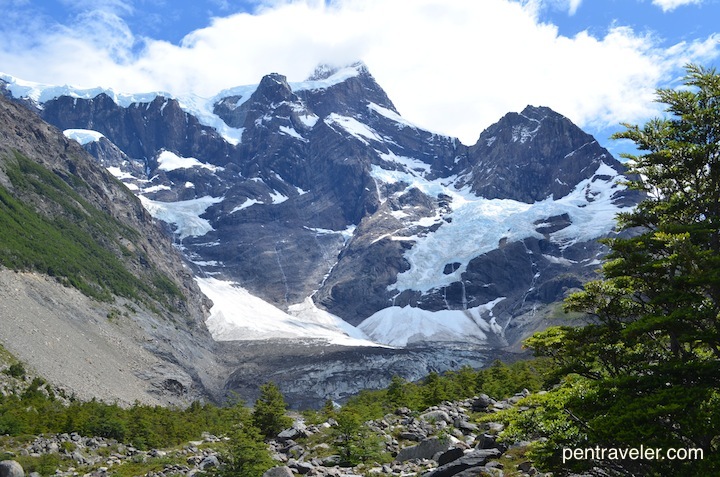 At 3,050M (10,007 ft), the Paine Grande mountain is an impressive sight face-to-face at the Frances Mirador. We avidly watched avalanches off the Frances Glacier, sounding for all the world like thunder. When you can tear your eyes from the falling ice, you have a spectacular 360-view. I kept forgetting this view was directly behind me. Watching for glacier avalanches is that mesmerizing. Zackary and I decided this Mirador was beyond amazing enough, especially given the three-hour-roundtrip the next lookout would require, and headed back down. Frances Camp is a newer facility, and a lovely place to spend the night. DAY 4: Long, and I saw icebergs! Frances Camp to Glacier Grey Mirador to Paine Grande Camp. I decided that for Day 5 I should follow the Trail Gospel’s advice for the earlier boat to the bus, so Day 4 was going to be a big one. At 8 a.m., I hit the trail, blessedly all to myself for nearly a full hour. I wasn’t sure if I was that much stronger or the hike was that much easier, but I sailed along the trail, halting only when the trial crossed a stark line from green full trees into stripped-bare trees. In December 2011, a fire started by a 23-year-old trekker in a non-approved campsite raged for over a month in Torres National Park, consuming 40 percent of the park. Four years later, the return of life is reassuring, but it’s hard not to feel bone-deep anger at the carelessness that led to such a disaster. You can see the clear line on the mountain where they were able to stop the fire that ravaged 40% of the park starting in Dec. 2011. 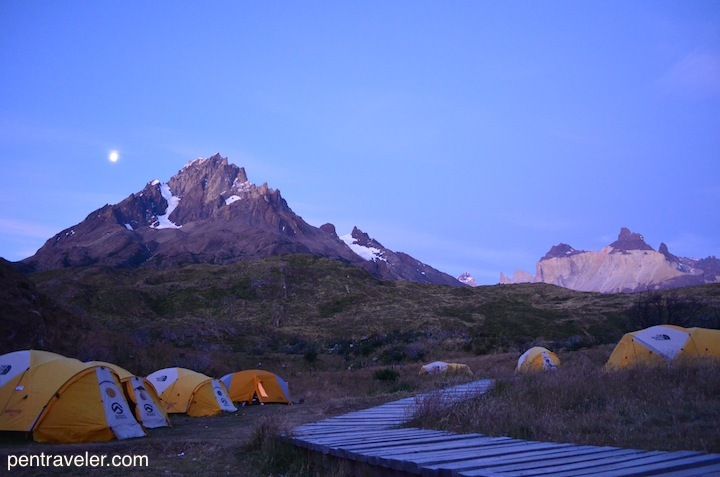 I arrived to Paine Grande Camp energized. A backpack lighter and a lunch fuller, I set off on my last leg of the W toward Glacier Grey. The trail felt solitary and fierce today, with the wind whipping off my hat when I wasn’t careful. Hiking along a ridge, I could see across the iceberg-dotted lake that sharp peaks were covered in towers of snow and ice—so deep that even at a distance I was intimidated by the raw menace of the place and its power to make me feel like a tiny speck on the planet. At the Glacier Grey Mirador, I sat and wrote until my fingers froze in the icy wind. Given my worsening blisters and the extra 3-4 hours the next destination would require, I headed back to camp, nearly dragging myself in by the end of it. Glacier Grey is spectacular, and one of the edges of the Southern Patagonia Ice field, the second largest nonpolar ice field on earth. I bought a cold beer from the camp store and promptly passed out for a few hours in my tent. Drained but happy, I watched the sun set and moon rise over the peaks I had finished “W”-ing. Paine Grande Campground in Torres del Paine National Park. I did all this! DAY 5: Sad to leave. Boat from Paine Grande to Pudeto, Bus to Puerto Natales. I had some time before the 10 a.m. boat to the bus stop, so I hiked up a path and wrote for a while. The 30-minute catamaran ride provided yet another satisfying view of the park that allowed a deep sense of accomplishment. I hiked to the waterfall near the Pudeto bus stop and sat in awe of these amazing last days. View from Salto Grande, a short walk from the Pudeto stop off the catamaran and bus. So happy to have been able to do the W! Just go. In fact, go now. I wish I was back already.